In order to live the leadership of letting go, it can be helpful to gain more insight into the sources of our need to control. While there are many sources, some of the more productive ones to investigate are linked to our personality. 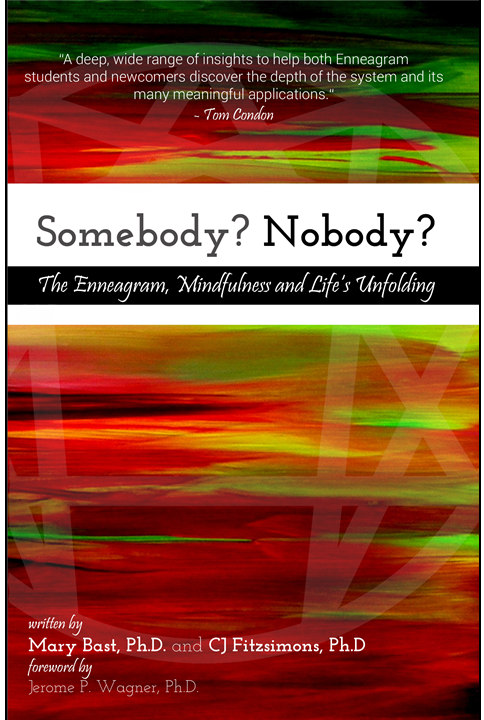 The Enneagram is a model of personality that sheds light on our worldview and our main motivations in life. One aspect of this is that we attempt to exercise control in particular situations in order to avoid something for us that is unpleasant (while for someone else it might carry little or no emotional charge). It can help us develop our leadership ability by becoming aware of such sources of the need to control. 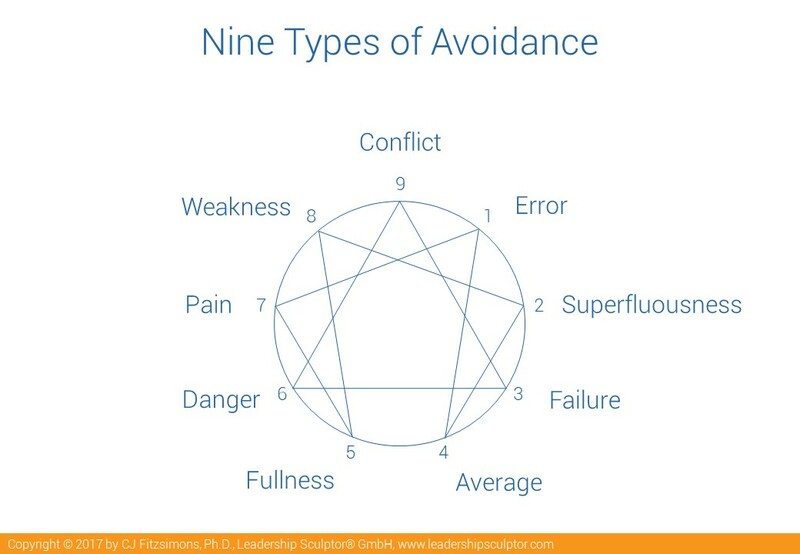 The chart here shows nine different themes of avoidance, sorted according to Enneagram Style, that particular people attempt to control in their lives in order to avoid something that for them is deeply unpleasant. For example, people of Style Nine (the Peacemaker) tend to place a high value on harmony and correspondingly find conflict deeply unpleasant. Therefore, they often attempt to mange their surroundings so that conflict won’t arise. One way to do this is simply to ignore a conflict (through which it often worsens); this strategy is pretty common in the workplace. Many leaders that I coach simply hope that the conflict or one of the conflict partners will go away (especially when one of them has a fixed-length contract ). Another way is to ask their team or colleagues about a given problem or question and go along with what they suggest. Once they notice this, they begin to improve their leadership. Style One (the Reformer) wants to reform the world thus attempts to exercise control to eliminate or avoid errors or mistakes. They like setting up processes that ensure the elimination of error. People of Style Two (the Helper) try to exercise control so that they – and their help – are needed. Who wants to be superfluous? I guess you begin to get the picture. If you already know your Enneagram Style, I’d love to hear about your avoidance patterns; if you don’t yet know your Style, which of the words jumps out at you? Say more CJ about the number 5. I am trying to understand how the 5 is seeking to avoid Fullness. In my understanding, I would think the 5 type leader would be avoiding emptiness and fullness is the response to that. What am I missing? Hi Dave! It might help if I give a couple of examples that people of Type Five have given me to describe how they see and meet the world. Their description sounds to me like strategies to avoid a full experience of life in the present moment. The first example involves the tendency that Type Five friends have to compartmentalize their lives. It’s happened me more than once that it turned out that a friend has been keeping his different friendships separated; these tend to be sorted according to a common interest. The picture of friendships then looks like a bicycle wheel: the Five positions himself as the hub and each friend is at the other end of the spoke. This makes it easy to manage from an energy perspective. However, the potential richness of a full network is lost. A second example revolves around the way many Fives have described to me how they tend to experience an emotionally-charged event during their quiet review of the event, rather than live, in the moment. How does this fit to your experience with people of Type Five? I would agree with you that the strategy is to avoid living fully in the present (but isn’t that a piece of all the Enneatype avoidance strategies?). I am thinking of all the time I’ve spent in my 5 stress point (being an 8). I have definitely shared the experiences you refer to. I wouldn’t use the word fullness though to describe what is being avoided, I would use overwhelmed. The image for that experience would be like a tsunami or great wave. The desire is to keep everything in life in its proper place so I don’t get “washed away” by the experiences that come. Fullness can fit in that description, but to me, fullness is a good thing (as opposed to emptiness). To me, fullness is also a good thing. I take your point on the overwhelm; it’s a better word to describe what I was trying to capture: thank you, David! I’ll update the chart accordingly. Emptiness can have it’s good side also. I would agree with you that the strategy is to avoid linivg fully in the present (but isn’t that a piece of all the Enneatype avoidance strategies?). I am thinking of all the time I’ve spent in my 5 stress point (being an 8). I have definitely shared the experiences you refer to. I wouldn’t use the word fullness though to describe what is being avoided, I would use overwhelmed. The image for that experience would be like a tsunami or great wave. The desire is to keep everything in life in its proper place so I don’t get washed away by the experiences that come. Fullness can fit in that description, but to me, fullness is a good thing (as opposed to emptiness).